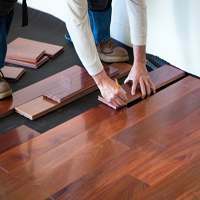 There are many reasons for those annoying wood flooring squeaks. They can begin when installing wood floors, or be caused by conditions that change after the floor has been in use for a while. Either way, understanding wood moisture content (MC) is key. It begins by ensuring that the wood’s MC is stable. Those who ignore this requirement risk MC-related squeaks, regardless of joists, nails, subfloors or surface flooring. A simple wood moisture meter used while installing wood floors can help users to tweak MC issues that can make a floor squeak. How is MC connected to squeaky floors? When installing wood floors, fluctuations in ambient relative humidity (RH) can cause wood moisture levels to fluctuate as well. Manufacturers kiln dry lumber optimally to a MC target, known as its equilibrium moisture content (EMC) when processing wood flooring products. But even from that carefully controlled beginning, wood naturally absorbs and releases moisture based on its surrounding environment, or ambient, RH. A wood moisture meter informs assessors how varying MC levels may cause changes in wood dimensions. When MC is elevated, wood expands; when the MC falls, wood shrinks. Naturally, these changes can cause shifts in contact points, joining systems and other “squeak potential” areas. All wood species do this organically, and some shrinkage or expansion is permissible under specified MC conditions. Moisture meters for wood provide MC information that assists knowledgeable contractors in avoiding the wood dimension changes that cause squeaks after builders have finished installing wood floors. It begins below the actual flooring itself. Determining MC is an essential part of quality control within the flooring installation process. Installers must know the MC of the wood flooring, as well as the wood subfloor. When the wood’s MC balances with the RH levels in the air, EMC is achieved. Therefore, it is imperative to measure MC with a wood moisture meter on subfloors as a preliminary part of installing wood floors. However, it is possible to strengthen weak subflooring. Hearty wood floor lovers can wedge up the subfloor from the joists below. 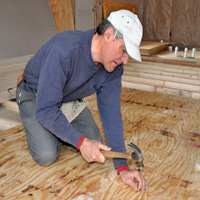 Also, remedial woodworkers can insert nails to the subfloor or add putty to any gaps. In place of putty, it is possible to inject wood adhesive to tighten the gaps. Notice how much material and effort is required here, when a good wood moisture meter measurement may have informed assessors of a MC issue in need of remedy before the flooring installation was complete. By using moisture meters for wood on subfloors, users can detect excessive MC levels. In that case, it is necessary to allow the wood subfloor more time to dry (for the MC level to come down) before installing wood floors. Many installers, professional or otherwise, assume that wood’s MC is stable once EMC is established at the lumber mill. Not so. In fact, the MC continues to fluctuate with changing ambient RH levels until the wood‘s MC is in balance with the surrounding environment. Put simply, moisture meters for wood empower their users to measure and manage MC while installing wood floors and well afterward. 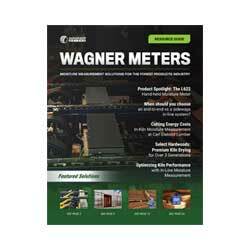 Wagner Meters manufactures moisture meter models well-suited to installing wood floors and for measuring other building materials in a home. The Orion® 930 Dual Depth Moisture Meter for wood measures the MC of common hardwoods, softwoods and exotic wood species at 1/4″ and 3/4″ depth modes. Wagner Meters also produces the Orion 950 Smart Bluetooth and Data Moisture Meter, which is a reliable, non-invasive way of measuring and providing comparative, relative MC readings in wood as well as Temperature and humidity data. Assessors may utilize the Orion 950 to identify problematic MC conditions in wood, synthetic stucco, drywall, plywood, plaster, insulation, shingles, linoleum and other building materials commonly found in homes. as well as understand the ambient conditions and dew point in the location.